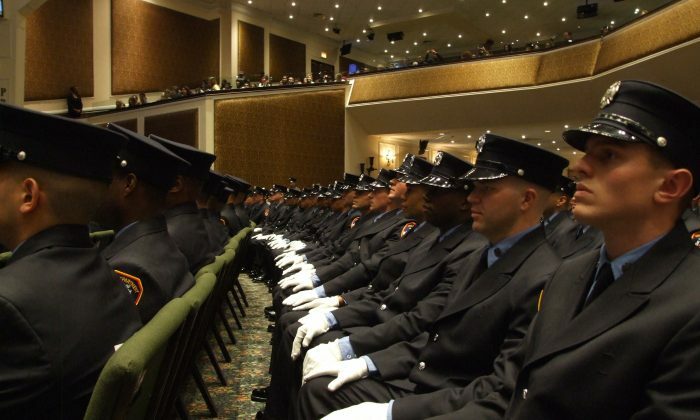 NEW YORK—The Fire Department of New York graduated its most diverse class in history on Thursday. When the class began training in July, there were 318 “probies”, 27 percent of which were African-American, 37 percent Hispanic and two percent Asian. “This is the most diverse class in the history of the department,” said Fire Commissioner Salvatore Cassano, who presided over the class’s graduation ceremony. The diversity of the class is no accident. Last year, a district judge in Brooklyn ruled that the hiring practices of the FDNY were discriminatory and ordered reforms. The U.S. Court of Appeals overrode the judge’s ruling that the city had intentionally discriminated, but left the changes he prescribed in place. Oversight of the department’s recruiting practices, a new entrance exam, and mandated quotas for underrepresented groups were all a result of that court case. The graduating class, the second this year, is a closely watched experiment. For years, the fire department has been 90 percent white and 99 percent male, despite the changing demographics of the city. Advocates of the new recruitment practices say it forces the fire department to reflect the diversity of the city, while others say it lets in unqualified applicants. Over the past 18 weeks, 25 percent of those admitted to the class have dropped out, about 15 percent above the average dropout rate. This may have something to do with the new quota system, as well as a change in the maximum age requirement. The court ruled that the FDNY had to hold 186 spots for blacks and 107 for Hispanics, and applicants who failed the entrance exam in years past were allowed to reapply, even some in their late 30’s and early 40’s. For the probies who made it to graduation though, Thursday was a day of pride and excitement. “It’s like the way the giants feel when they won the Super Bowl and went to Disney World,“ said Pierre Cesar, a graduate who knew since the second grade he wanted to be a firefighter.